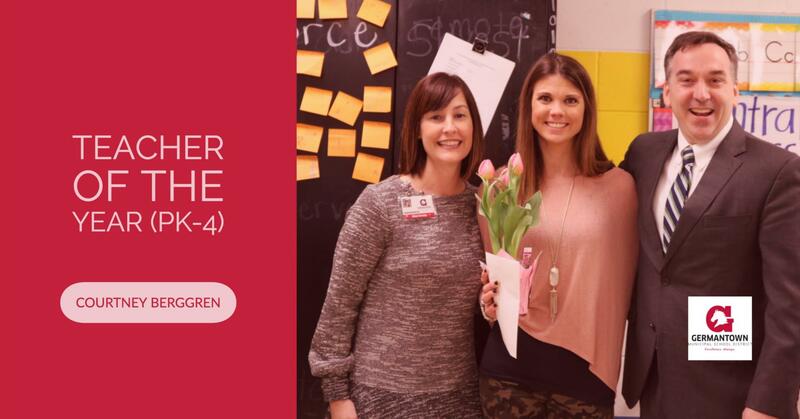 “On the first day of school, I tell my students I specifically chose them to be in my class because of their unique talents and strengths,” shares Farmington Elementary School first grade teacher, Courtney Berggren. She says that this particular role-play helps to create a “family type classroom environment” and Berggren exemplifies this in her highly esteemed teaching strategies. “Mrs. Berggren is such a well-rounded teacher. She combines consistently high expectations with a nurturing attitude that pushes students to be their best every day. Her students love her and know that she loves them. When you have that, students are willing to work hard to meet expectations,” says Principal of Farmington, Zac Percoski. In a classroom, based on mutual trust and respect, her students are able to dive much deeper into the reading curriculum using meaningful and authentic texts. The instruction is student-centered and relies on some great teaching tactics like “Wonder and Notice” and the “Inside/ Outside” vocabulary strategy. Back to the concept of a student’s first day, Berggren has developed her own strategy in which she will exit the classroom during a lesson and pretend that she is a student on their first day at school and will ask the students for help on the lesson. “I make mistakes during my think-aloud [as a new student] and this encourages my students to articulate the big ideas of the lesson and monitor their own progress. I believe even our youngest learners are capable of having ownership in their learning, which enhances retention of grade level standards,” shares Berggren. Her adept skill implementing the new Wit and Wisdom curriculum have not gone unnoticed. She has hosted dozens of visitors, teachers and administrators, from all over Tennessee. “Mrs. Berggren has embraced our curriculums and made them her own. This has turned her into a valued resource in our building and across the state,” said Principal Zac Percoski. The TN State Department of Education Commissioner Candice McQueen was among the many visitors to her classroom last year. 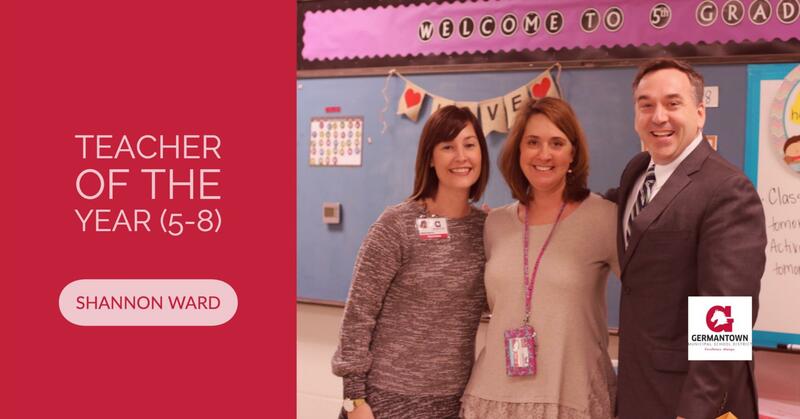 As a part of her Classroom Chronicles series, in which she visits schools across the state, Farmington Elementary School was chosen and of the teachers in the building only four had their rooms showcased for the Commissioner. She enjoys running in her free time and is a routine fixture in local races. Passing along that passion to the students at Farmington Elementary School she has served as a coach for the Run Like a Girl Club and served on the GMSD Color Run Planning Committee. The bell rang in a fifth grade math classroom. “That’s all we have time for until tomorrow,” announced Shannon Ward to her class. Audibly one student groaned, “Aww”. Her students could not wait to get back to learning about dividing decimals with double digit divisors. How does she do it? Riverdale’s Shannon Ward has recently been named this year’s Germantown Municipal School District Teacher of the Year for Grades 5-8. Ward began her career as a Kindergarten teacher in Shelby County Schools, taking a short break to have children of her own. It was during that time that she accepted a part-time position designing and implementing a program for struggling math students in grades 3rd-5th at a private school. Fast forward to 2014, when Germantown Municipal Schools were forming—and Ward had decided she was ready to come back to the classroom. Ward described her initial experience at Riverdale as being particularly impressive, and after a tour by Principal Joseph Bond she immediately pulled her children from their current schools and accepted the job. That year, Ward and all of her three children began their first year at Riverdale together. She’s taught several grades, earned her Master’s, gained an administrative license and assumed the job of GMSD Math Content Lead. Ward shares a unique connection to the new state math standards and how the instruction has shifted to meet them. As a math student, Ward confessed, “I struggled. A lot”. It wasn’t until her freshmen year of high school that she had a teacher who taught her in a way she could understand. “The idea of conceptual math learning, and seeing it a different way—this teacher was way ahead of her time,” said Ward. As luck had it, she had this teacher for all four years of high school math and she found the teaching methods transformative. Years later, Ward is employing the same methodology to teach her students. “I think the biggest thing about teaching math is that students need to feel safe to make mistakes. So, in here we celebrate mistakes,” said Ward. In a climate of changing curriculum and what seemed at first like a complicated process to teachers, she has been able to thrive. With the memory of a teacher who taught in a similar manner, her experience working with struggling students, and her role as a mother, Ward handles the new way of teaching with ease. “Between my children and I, we had experienced every grade level [1st-6th] in Eureka Math in a two-year period. And, seeing the progression [vertical alignment] of the standards and strategies brought the program into focus for me,” said Ward. Knowing how it all tied in together had some huge benefits for her as a teacher. Ward’s classroom is heavily routed in structural routines, and the students are clearly well-versed. They come right in and begin individual work in Dreambox on their iPads while Ward conducts housekeeping chores. Some students earned punches on their punch cards for good behavior and redeemed them for little prizes while others had questions about yesterday’s lessons. Shortly thereafter, the class began with a quick discussion about the learning target. The students actively engaged in making connections to a previous lesson. They then launched into a math sprint—a race that is aimed at increasing fluency. Ward challenged the class herself, and was barely beaten by a quiet gentlemen in the back of the class. He was delighted. As whole group instruction began, she called out the names of students who were entitled to flexible seating arrangements for this particular class (she keeps a rotational list). A yoga ball, a carpet, some lawn chairs and stools provided the chosen students a different place to enjoy the lesson. “I’m a very structured teacher, but also very accommodating,” Ward explained in an interview. But, says Ward, “Student growth and learning can look different for some students”. She cites numerous strategies and supports students who struggle are given in her classroom. To the delight of her class, she practices good, formative assessment—“I allow students to retake tests or assignments if they show they have not mastered the standard being assessed,” she shared. She also uses data trackers giving “students an opportunity to evaluate themselves and be responsible for their own learning”. Ward also helps administer professional development to and mentors several of her teacher peers. She’s TEAM certified and can also evaluate fellow teachers on the TEAM rubric. “During these meetings, we [have] spent time covering important topics that enable us to improve our teaching across the grade band. Her resume is full of both leadership roles around the school as well as accolades, like Shelby County Schools Teacher of the Month, the Sister Ruth Ann Schmitt Award, the GMSD Superintendent’s Teacher Feature, and the Germantown Municipal Council S.T.A.R. of Excellence Award for her exemplary efforts in the classroom. In case you were wondering, it’s been since 2006 when Michael Robinson of Houston High School was named Teacher of the Year by legacy Shelby County Schools—and he has done a lot of things between now and then. 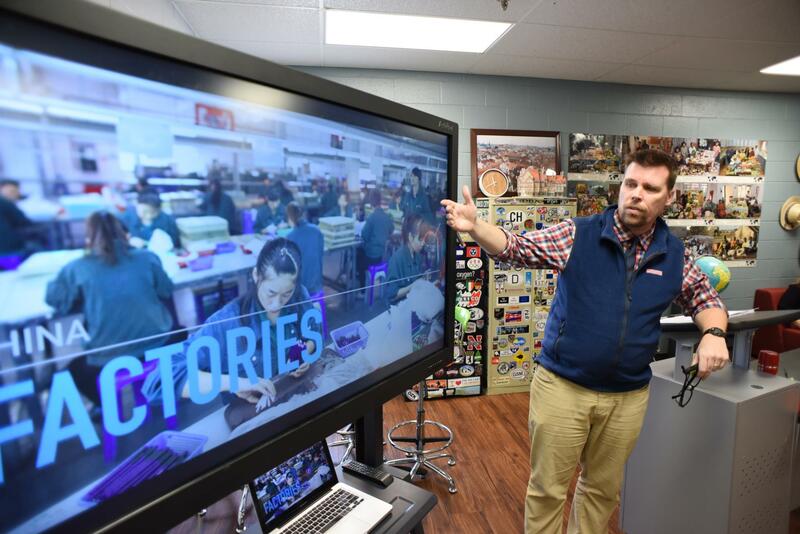 Besides his 23 years serving as a teacher, mentor and faculty advisory member to the schools he’s worked at, he also lends his expertise to social studies teachers on an international scale. A current board member and webmaster for the Tennessee Council for the Social Studies, he regularly contributes lessons and ideas via webinars, presentations, and maintains a lively website. “In preparing for that [a teacher workshop for AP Human geography teachers], I put some of my activities on my website to share with the other teachers there. I have continued to add to my website, and currently I have 128 activities for each unit of the AP course and 215 videos with guiding questions,” shared Robinson. The website has become hugely popular and Robinson now regularly receives emails from teachers all over the world commenting and asking questions about the activities. An impressive roster of 33 presentations and publications litters his resume from topics like Trampolines, Toilets, and Tents: Teaching Development in a Social Studies Classroom and From Big Macs to Goats: Using a Variety of Geography Resources in the Classroom. More impressive, however, is his list of accolades, awards, and travel awards—that’s right—some organizations pay him to tour exotic locales so that he can bring that knowledge back to the classroom. Robinson and his wife also enjoy serving as routine chaperones for student trips abroad to places like Mexico, Costa Rica, Peru, Puerto Rico, Spain, France, Italy, Germany, Austria, Switzerland, UK and Ireland. Years ago as Tennessee moved to the TEAM evaluation model, Robinson says he reformed his focus as a teacher to inquiry-based and student centered learning. As he expanded his lessons using this methodology, he said, “The success of those first few activities lead to more activities, which eventually lead to a complete shift in my approach to classes. I rarely lecture; I focus on student participation and making students think about the learning”. This pedagogical change lead to higher success rates in the AP scores of his students who last year scored an average 4.14/5 while the national average was 2.61/5. Perhaps more of a testament to the success is the growth of 110 students enrolled in AP Human Geography from his first year in 2006 with only 10 students. At Houston High School, Robinson also began a speaker series called, Our World Lecture Series: Breaking Down Walls, in which guest speakers visit the school outside of class time to expose Houston students to cultures, religions, jobs, etc. that they may know very little about. “It really is designed to “break down” the barriers, stereotypes, and misinformation students may have on a wide range of topics,” explains Robinson. From year to year, the popularity of these after school sessions has also grown in interest and student attendance as Robinson has opened it to the entire student body.